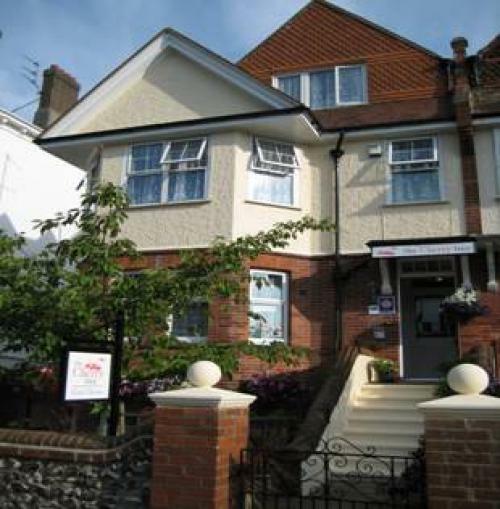 The Cherry Tree is situated in the Lower Meads district of Eastbourne about a 15 minute walk to the town centre and 100 metres from the seafront. The house is about 100 years old and we have recently completed refurbishment of the entire property. Nine letting rooms are available on the 1st and 2nd floors. There are three single, three double bedded, two twin bedded and a family room. We look forward to welcoming you. If you have any queries or require any assistance please phone 01323 722406 or email melanie@cherrytree-eastbourne.co.uk. We are located at 15 Silverdale Road and a map of how to reach us can be found on the Location page of our website. We are on the Number 3 bus route from Eastbourne Town centre ( bus stop in Terminus Road near the railway station ) which runs every 20mins , 7 days a week. The nearest bus stop is on the corner of Compton Street and Silverdale Road , 50 metres from our Front Door. Taxis are available from outside the railway station. If you require an accessible taxi these can be pre-booked on 01323 720720. Silverdale Road has wide paved pavements. Car parking is on street. Parking is free and unrestricted along Silverdale Road and adjacent streets. If you have difficulty finding a space on arrival please ring our doorbell and we can provide a permit for use on the metered parking zones about 100 metres away. Access to the property is up a small step from the pavement through the front gate onto a paved path which leads to a flight of 8 steps to the front door. There is a handrail on the left hand side of the steps. The front door is 850mm ( 33.5") wide giving access to a small porch with a similar width door leading into the hallway. The hallway is level throughout leading to the reception area through an internal door 710mm ( 28" ) wide. The hallway and reception flooring is non-slip vinyl. The hallway/reception areas are evenly lit with overhead lighting and a table lamp. There are five bedrooms on the first floor accessible via two short flights of stairs of 10 and 6 steps separated by a small landing . The doors of the two twins on this floor are next to each other and reached via a small lobby. The lobby area creates a more private space such that a personal assistant/carer or friend/family member could use whilst having easy access to the adjacent room. The lobby door is 680mm (27") wide and the doors to the bedrooms are 700mm (27.5"). The bedrooms are numbered with raised brass numbers at head height. Furniture could be removed or rearranged in the larger of the twin rooms on request. The height of the beds from the floor to the top of the mattress is 530mm (21") with a 280mm (11”) space under the beds. Our beds are made up with duvets with standard pillows of man-made filling or feathers. Alternatives can be provided on request. Wall mounted TVs with subtitles are provided in each room. Rooms are bright and evenly lit with a combination of ceiling lights and lamps either wall mounted or on the bedside table. Flooring is level and covered throughout with short pile carpeting. Bathrooms are en-suite at the same level as the bedrooms. In the smaller of the twins (Room 6) the door is 660mm (26") wide and in the next door twin (Room 5) 710mm (28.5" ) wide. The space between the nearest single bed and bathroom is 360mm (14") between the corner of the bed and bathroom door frame. Both rooms have baths with two handles on either side and integral shower. A hinged shower screen extends half way down one side of the bath. Toilets seats are 400mm (16") from the floor. The washbasin in Room 6 is 850mm (33.5") high with hot and cold lever taps. In Room 5 the top of the washbasin is 1020mm (402) from the floor with a single lever tap for both hot and cold. Both bathrooms are well lit with ceiling lights and illuminated mirrors. Flooring is black non-slip vinyl contrasting with white tiled walls. All public areas are well lit with chandelier and ceiling lighting. The reception desk is lit late at night by a side lamp. Bedrooms are reached by carpeted stairs with a handrail on the left handside. There are 16 stairs in two short flights of 10 and 6 steps separated by a small landing . First floor corridor is 560mm (22") wide and that of the second floor 760mm (30") both with a short pile carpet covering. The lounge is situated off the entrance hall with level access. The door is 740mm (29") wide. Seating is on two leather and one cloth settee around a central coffee table. Clear width between settees is 560mm (22"). The nearest accessible toilets are a ladies toilet reached via reception down three steps. A gentlemens toilet is situated on the half landing between the ground and first floors reached via a single flight of 10 steps. There are individual small tables for each room with upright chairs without arms. The height between table and floor is 610mm ( 24"). The room windows face south and is well lit with natural light supplemented by ceiling and wall lights. There is a sideboard where guests can help themselves to cereal, yogurt, fruits and juices. Assistance can be provided on request. Special diet or allergies can be catered for with prior notice. Crockery has a patterned rim contrasting with pastel coloured tablecloths. Nearest toilets are reached off the reception area. The front garden is available for guests and is accessed down the 8 steps that lead to the front door. A hardwood bench, two chairs and a low table are provided. Guests may smoke in the front garden.